The children really related to the bullying messages. Some of them have told me that the show will help them speak up and help other children. We all learned a lot of lessons, and loved your character-education assembly program! In this character-education school assembly program, James stresses the difference between direct bullying (such as threatening or hitting), and indirect bullying (such as spreading rumors), and lets students know that indirect bullying is just as serious. 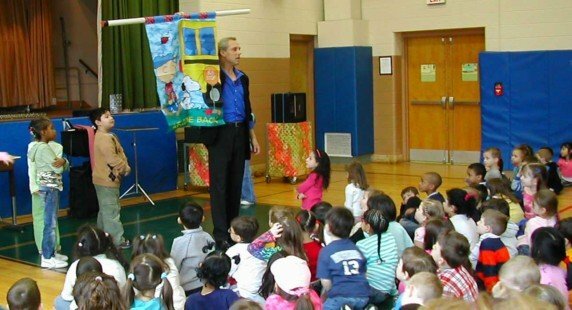 As in all James’ school assembly programs, the character-education assembly uses magic illusions and lots of humor and audience participation to illustrate these and other points. Read what dozens of teachers, administrators, counselors, and parents have to say about James’ character-education assembly (and others) for elementary school students. James did a wonderful job! The program blended magic with an character-education message that was loud and clear. We had two programs, and the K-3 was approached in a way that was very age appropriate. He did a different show, again age appropriate, for our older students. The kids (and adults) laughed and had a great time. I would recommend James without hesitation. We have had several bullying assemblies over the years, but yours was the BEST character-education assembly we’ve ever had. And your programs were perfectly tailored to the different age groups. We’ll spread the news to the other schools in our parish. James, we got good feedback from the students. They enjoyed the performance and understood the character-education message. Thank you for the great performance! Although fun tricks and illusions were used, Mr. Warren’s character-education message was clear and easy for the students to understand. Students were totally engaged and captivated by his humor and audience participation. It was an awesome performance! In planning this program, I was afraid the magic wouldn’t match with the character-education message we’re trying to communicate to our students – but you covered everything we wanted to say, and did it in a way the students loved!